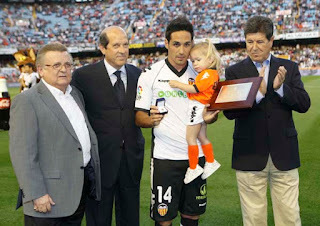 May 15, 2011, Sunday, Vicente Rodriguez played his last match for Valencia CF. Valencia made a special farewell event at half time, the crowd applauded very loudly showing their support and appreciation for the player and he received a Valencia token for his contribution given to him by the current Valencia president Llorente. Vicente Rodriguez has played for 11 long years for Valencia and has been one of the absolute best when not injured. He basically had 5 superb years from 2000 to 2005, but then all the injuries started cropping up and his contribution was limited. Vicente has played 242 games and scored 36 goals for Valencia in 11 years, he has also played for Spain senior squad 36 times scoring 3 times in the process. Vicente Rodriguez had a good comeback when Unai Emery took charge, but by that time he had to fight for a spot with Juan Mata and we all know how good of a first season Mata had, instantly becoming one of the best players in Spain, if not Europe. Unfortunately for Vicente even more injuries would cripple him and essentially his career end with Valencia right now is because of injuries. Titles: 2 League, 1 Cup, 1 UEFA Cup, 1 European Super Cup, finalist in the UEFA Champions League, a member of the best team in the world in 2004.